Apple could release just one new OLED-based iPhone alongside two new iPhone models with LCD displays this year, according to a new report today. Previous reports have gravitated towards the view that Apple will launch two new 5.8-inch and 6.5-inch OLED iPhone models and only one 6.1-inch model with an LCD display. 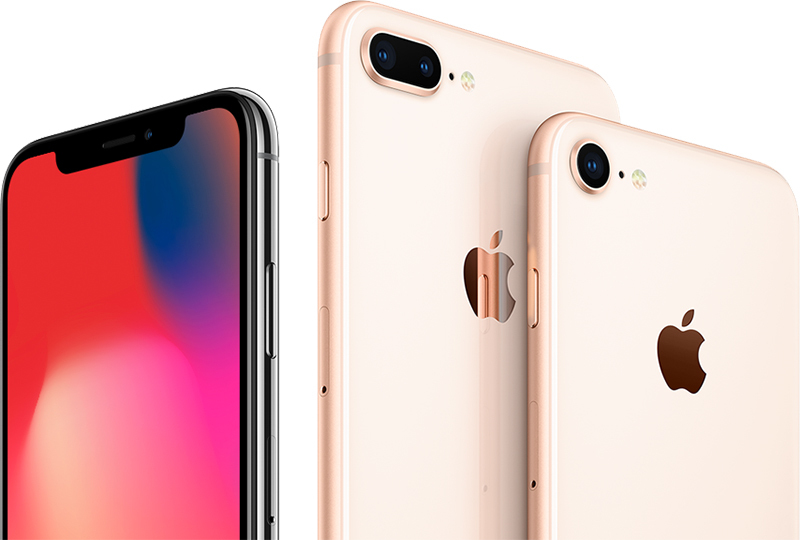 However, Digitimes Research senior analyst Luke Lin believes Apple is increasingly leaning towards releasing two LCD-based models – one between 5.7-inch and 5.8-inches, and another between 6.0-inches and 6.1-inches. Lin also claims the 6.1-inch OLED device Apple is testing is falling out of favor, and the company sees more of a future in a larger 6.4- to 6.5-inch OLED model it is also testing. Such a line-up would be similar to the iPhone range Apple launched last year: Two LCD-based devices in the iPhone 8 and iPhone 8 Plus, and the OLED-based iPhone X. Lin believes the four iPhone projects Apple is working on all support wireless charging and 3D sensing functionalities. However, Lin believes Apple has not yet made a final decision on the combination, so the 2x OLED/ 1x LCD iPhone line-up predicted by KGI Securities analyst Ming-Chi Kuo could still play out. Taiwan-based website DigiTimes has a mixed track record at reporting on Apple's upcoming product plans, but its sources within the upstream supply chain have proven reliable in the past. However, its in-house research arm remains an unknown quantity, so we remain guarded on the accuracy of this prediction going forward. Earlier this week, Taiwan's Commercial Times added to the speculation by claiming Apple's rumored 6.1-inch LCD iPhone will use Japan Display's so-called "Full Active" LCD technology, enabling it to have a taller display and ultra-slim 0.5mm bezels on all four sides, making them smaller than those on the iPhone X. Also today, Digitimes analyst Lin claimed Apple is working on a new entry-level smartphone model similar to the iPhone SE that will support wireless charging and be ready for launch in May or June. Kind of wish they'd stop pulling the whole this size is slightly different in some areas. Wish they'd just release 3 sizes of phones, with the same feature set and keep it simple. Instead you're thinking "hmm, well if I get the 4.7" model iPhone 8, I don't get the best camera, but if I get the iPhone 8 Plus, then I do, but not as great as the iPhone X"
I realize it's not practical, but apple is the king of making the impractical, practical. OK, we've covered 1 LCD, 2 OLED and now 1 OLED, 2 LCD. So we just need a couple more geniuses to predict 3 LCD, and 3 OLED. * Just like the wild rumors of last summer about last minute changes to the iPhone lineup that ended up untrue, I believe the designs for iPhones for this fall were locked in last fall. The only way this is true is if it is old info from a few months ago. So some phones will be released, with some sizes and some screens. After the visual and migraine difficulties I and some other MR forum members had with OLED on the X, I welcome any rumors that indicate Apple is not done with the very excellent LCD displays they’ve perfected in the last couple of generation of iPhones and iPads. (Well, as close to perfection as these things can get, anyway). I know there are key advantages to OLED, and that for many people here it’s “OLED or bust”, but it is difficult for Samsung and other makers to get consistent quality yield. Those of us who have owned or seen several samples of the same model of Samsung phones or iPhone X, or even phones with LG OLED displays, have noted marked disparity among different samples in the following characteristics: brightness, color temperature, evenness of luminosity and hue across the display, and degree of off axis color shift. There is a huge “display quality lottery” out there that a lot of people have yet to realize until they put their phone next to someone else’s. I think at this point it’s more pronounced than what we’ve seen in the variances among LCD displays. In the last couple of generations of iPhones there has been better consistency across samples. And I don’t know about everyone else’s experiences, but for me, True Tone on the OLED is not a thing of beauty on all iPhone X’s. It was an atrocious salmon pink on the one I returned. It was nice and worked well on my husband’s. Yet overall, my X had the brighter band more attractive display as long as True Tone was turned off. I doubt the source of these rumors. But IF Apple is still committing resources to LCD, I would not blame them in the least nor think they are behind the times. The bleeding edge isn’t a comfortable place to be, yet. Did they not learn anything from the past? Sure it won't be marketed as "2nd generation", they never did that with any product, but that will be it's official name. In marketing, it will just be "the new iPhone X". As for the iPhone X Plus, marketing will be obvious. At this rate, they will release an update to the iPad Mini and discontinue the iPhone.